You might not know it but optical complaints in cats are relatively common. However, because they are naturally independent creatures that tend to hide their afflictions well, it is not always obvious when a cat is suffering. Also, because eye problems aren’t as pronounced in cats as they are in dogs and horses, they often go unnoticed for some time until symptoms progress. For one thing, inflammation doesn’t show itself so prominently in cats; neither does corneal damage or disease manifest so visibly. If your cat has an eye complaint, the first things you will probably notice are excessive squinting and/or tearing. If the cornea is damaged or ulcerated, your cat will keep its eye closed to lubricate the eye as much as possible. Some optical problems will be glaringly obvious with symptoms that are impossible to miss (if your cat lives indoors), while others will be much harder to spot. Symptoms can include crying and/or discharge from the eye, cloudiness of the eye, a difference in pupil size, and sensitivity to light. If you suspect there is something wrong with your cat’s eye health or vision, have your vet examine her at the soonest convenience. Delaying diagnosis could seriously jeopardise your cat’s sight and prompt treatment may even prevent or delay blindness. Although primary eye conditions do occur, more often than not they are seen in association with an underlying systemic illness. Conjunctivitis or 'pink eye' is usually caused by infectious organisms already present in the body. The most common of these is the herpes virus (FHV-1) and Feline Chlamydia, which are transmissible between cats through direct contact or the contamination of feeding equipment and environment. While the condition can be painful, it is better described as uncomfortable, causing excessive itching and irritation. Because the condition can be symptomatic of a more serious underlying problem, it is essential you have your cat examined as soon as you first see changes. Conjunctivitis is characterised by squinting and watery discharge, which may be clear, yellow, green or dark red in colour. Other symptoms include redness and swelling of the eye tissue, excessive blinking, fluid build up in the eye, and signs of an upper respiratory infection. Sometimes, an allergen (dust, moulds, grasses) can trigger a response that is easily mistaken for conjunctivitis. Eye traumas can also prompt inflammation of the conjunctiva. To accurately diagnose the problem, a green dye called flourescein is applied to the affected eye; if there is anything wrong with the cornea i.e. ulceration, the flourescein will turn bright green under magnification. When it comes to treating the problem, as a number of cases are the result of a virus (FHV-1), topical antibiotics aren't always an effective course of treatment. Anti-inflammatories can be prescribed to reduce optical swelling, or, if the cause of the conjunctivitis isn't infectious, steroidal eye drops may be used. To view our wide range of eye gels and drops, click here. 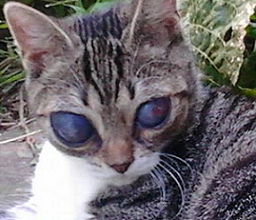 Cataracts are not particularly common in cats, although they are seen in some geriatric animals. Uveitis (eye inflammation) is one of the leading causes of cataract development and usually signals underlying illness. Initally, the eyes will appear clouded or opaque and the transmission of light to the eye's retina will be impeded. Sometimes, cataracts are associated with natural ageing and can be left alone unless they start impairing vision. The presence of cataracts indicates progressive degeneration of the eye - to be expected to some degree in the older cat. In the incidence that vision is impaired, surgery would be needed to correct the problem. 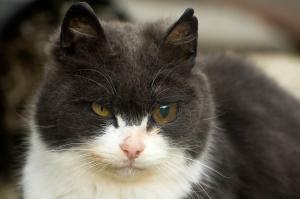 Corneal ulceration is a much more common problem in cats and one that can be extremely painful. The cornea is the glassy outer layer of the eye that admits light. It consists of many different layers, including the epithelium, the stroma, and Descemet's membrane. If the integrity of these layers is compromised, whether because of a blunt or penetrating trauma, infection, disease, or the invasion of a foreign body, the eye can quickly become ulcerated. Generally speaking, an affected animal will have been wounded; either, it will have crossed paths with another cat - perhaps a more vicious one - and its eye will have been swiped with a sharp claw, or, a low-hanging branch will have poked it directly in the eye. Because corneal ulcers are so painful, cats will either hold their eye closed or will constantly paw at it. Other symptoms include redness and swelling, squinting, excessive tearing and/or discharge, and a noticeable film or clouding across the eye. To diagnose a corneal ulcer, a fluorescein dye may be used to detect a break in the integrity of the eye. If the epithelium stains, this indicates that the cornea is damaged. Before staining the eye, the veterinarian may check for infection, which involves gently swabbing the ulcer. If the laboratory results come back positive for infection, a course of antibiotics will be prescribed. If not, medicated eye drops may be prescribed to prevent infection and help soothe the eye. Corneal abrasions and superficial ulcers shouldn't take too long to clear up following a diagnosis. Deeper ulcers, however, are much more troublesome to treat. With severe cases that threaten the eye, while the ulcer heals, the cornea must be protected. Sometimes it is necessary to surgically seal the eye for a few days to allow the cornea to heal. Octavia Brown - who owns Tommy the Cat, pictured above and below - suffered a traumatic ordeal after he was brought to her suffering from Feline Herpes Virus (FHV-1), a disease that ultimately cost him his sight. Octavia explains, "FHV-1 symptoms are easily overlooked, as Tommy the Cat discovered to his detriment. He was found with runny eyes, nose and congestion and was treated with antibiotics for a respiratory tract infection, while his eyes were treated separately for conjunctivitis. Failure to treat his FHV-1 infection resulted in glaucoma in both eyes which caused severe swelling and frequent rupturing. By the time he came to me his corneas were very badly ulcerated - a desperately painful condition..."
"...Several attempts and various treatments were tried to reduce the swelling and possibly save his eyes, if not his sight. However, the condition became so severe that the decision was eventually made to opt for double enucleation (removal of the eye). The sad thing is, all this could have been avoided if he had been correctly diagnosed and treated at the very beginning. 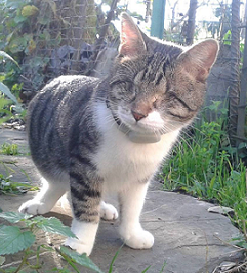 Despite all this, Tommy the Cat now leads a full and happy, albeit sightless, life and has adjusted to his disability to the point where it no longer is one."